Before getting into what is check point restart and how to implement it,you need to understand when and why you should go for it. Suppose, a batch program that basically reads an input file and posts the updates/inserts/deletes to DB2 tables in the database was abended before the end of the job because of some reasons; Is it possible to tell - How many input records were processed? Were any of the updates committed to the database or can the job be started from the beginning? Assume that COMMIT logic was not coded for large batch jobs that process millions of records. If an ABEND occurs all database updates will be rolled back and the job can be resubmitted from the beginning. If an ABEND occurs near the end of the process, the rollback of all the updates is performed. Also, DB2 will maintain a large number of locks for a long period of time, reducing concurrency in the system. In fact, the program may ABEND if it tries to acquire more than the installation-defined maximum number of locks. One of the problems with restart is synchronizing DB2 tables and output files(If your program updates some output file). DB2 will rollback all work on DB2 tables to the last commit point; but for output files we have to delete all the records up to the last commit point. (One option to do this would be via a global temporary table, FILE_POSITION_GTT, See FILE REPOSITIONING section for further details.). The DISCONNECT (CONDITIONAL) bind option is in effect and an open WITH HOLD cursor is not associated with the connection. ► All open cursors that were declared with the WITH HOLD option are preserved, along with any SELECT statements that were prepared for those cursors. ► All other prepared statements are destroyed unless dynamic caching is enabled. that are bound with KEEPDYNAMIC (YES) are kept past the commit. * Bind option DISCONNECT (CONDITIONAL) was used and there are no hold cursors. A place to store the details (CHECKPOINT-COMMIT record) pertaining to the current execution of the program, like various counts (number of inserts/deletes/updates/selects), number of processed, processing dates, and other details which are needed in the program after a RESTART. A reliable FILE RE-POSITIONING logic with minimal changes to the existing PROCJCL. Flexibility, to modify the commit frequency without changing the program code. Where we can store this CHECKPOINT-COMMIT record? 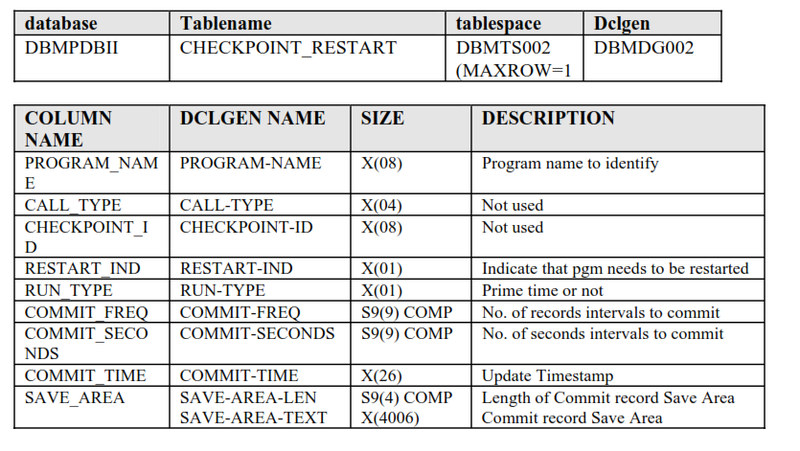 information in a DB2 table . 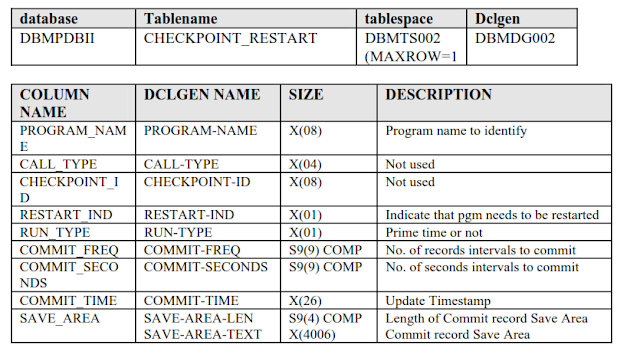 For ROLLBACK stmt, DB2 deletes the instance of the temporary table. for accessing temporary table is defined WITH HOLD and is open. • The application process ends. In next part we will discuss step by step process of check point restart installation along with sample code.